This is the second version of yesterday’s drawing, this time a stone lithograph. The process involved in this one gave it a more scribbly feel, and the haloing effect washed out the face, and obscured the arms in stark black shadow. The feel of this image is different than the first version for me, despite being essentially the same thing. It’s rougher, more abstract, as though the angel has begun to fade into his component parts, the whiteout glow of his halo making the shadows deeper and obscuring detail where it’s the brightest. I ran 6 of these before clearing the stone for other use, on a heavy grey acid-free art paper. The edges of each one are hand-torn so they’re all slightly irregular, and there’s inky fingerprints around the borders of each one as a testament to their handmade nature. 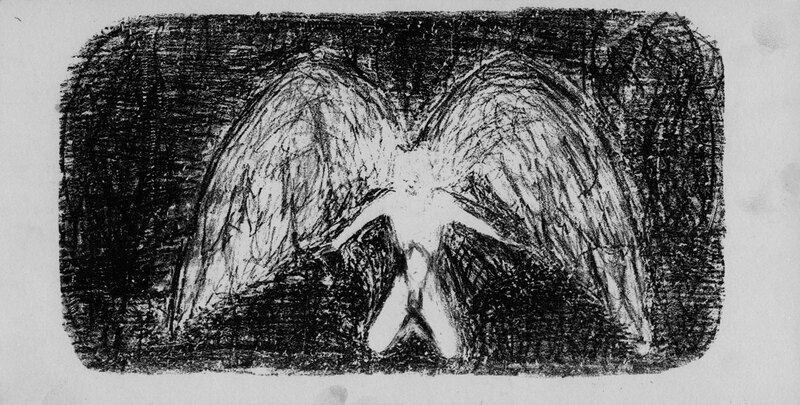 Bound Angel 2, 14″x7″ stone lithograph on art paper, edition of 6, $99 each with free shipping.